Beet leaves have lots of vitamins A and C, are a good source of fiber, and, best of all, they taste good with a slightly sweet flavor. The leaves have red veins and stems, which makes them attractive as a side dish. 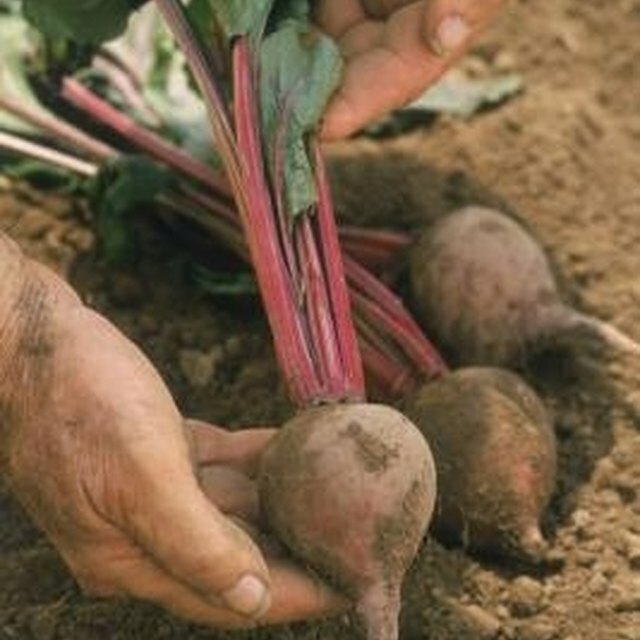 Beets in the grocery store are often sold with the tops or leaves still attached. Choose a bunch with fresh-looking leaves that aren't moldy or discolored. Serve very young leaves raw in salads, or steam the beet leaves. Steam the stems of the beets as well as the leaves. Rinse the beet leaves under cold running water. Cut the stems close to the beet root. The stems are edible as well as the leaves. Fill your sink with cold water and put the leaves into the water. Swish them around. Lift the leaves up and out of the water. Any remaining dirt is left in the sink. Do this twice. Chop the stems into 1/2-inch pieces. They take longer to cook than the leaves, and the smaller pieces make them cook more quickly. Stack large leaves, those more than 6 inches long, on top of each other. Cut the stack in quarters. Place a metal colander into a cooking pot. The colander should not reach the bottom of the pot. Fill the pot with water until it is 1/2 to 1 inch from the bottom of the colander. Put the beet leaves and stem pieces into the colander. Place the pot over high heat until the water starts to boil. Cover the pot with a lid that fits tightly but has a vent for the steam to escape. If your lid doesn't have a vent, tilt it just a bit for the steam to escape. Steam for two minutes. Stir the beet greens so the ones that were on the bottom are now on the top. Steam until the leaves are tender. Exactly how long depends on whether you prefer the leaves crisp-tender or completely soft. Thicker leaves from bigger beets take longer to steam than young small leaves. Start by steaming for a total of three minutes. Taste-test a beet green to see whether it's done. Use a steamer instead of the pot and colander, if you have one. Beet juice may stain your hands and cutting board. Steam is hot enough to burn. Don't stand over the pot when you remove the lid. Keep your face to the side.